I began this scarf years ago. The pattern was one I loved which I knew would be great for a scarf. At the time I was looking for yarn Leah was always asking for yellow anything. I sought out some yarn with little luck until I found a decent shade of yellow. The yarn seemed like a good choice at the time but as I began to knit further and further along I knew the yarn was not the best. The texture was not as easy as I hoped it would be for kntting a lace pattern. There was not the level of glide I anticipated which meant that knitting this scarf became more of a chore. I dreaded using that yarn. Years passed. There it remained in my knitting bag next to my favorite chair in the family room. Eventually the scarf began to creep deeper into my bag until finally it was buried under countless other projects and skeins of yarn. After finishing Adelynn's cardigan I was looking for something else to work on. I had Leah's and Olivia's Tiny Tea Leaves on my horizon but was waiting for the yarn for Leah's sweater to arrive. Until then I needed to work on something. I considered starting another project. Oh how I am great at starting projects. I love the excitement with something new, don't we all? Instead of beginning another project I decided to finish something old. There it was. That scarf. That scarf. I did not want to touch it. Still after all those years I had a difficult time picking it up. After much self talking I finally reached in and took it in my hands. Yes the yarn was still terrible. Yes it was still a beautiful pattern. Rather than think any furhter about the scarf I found myself knitting it row after row. 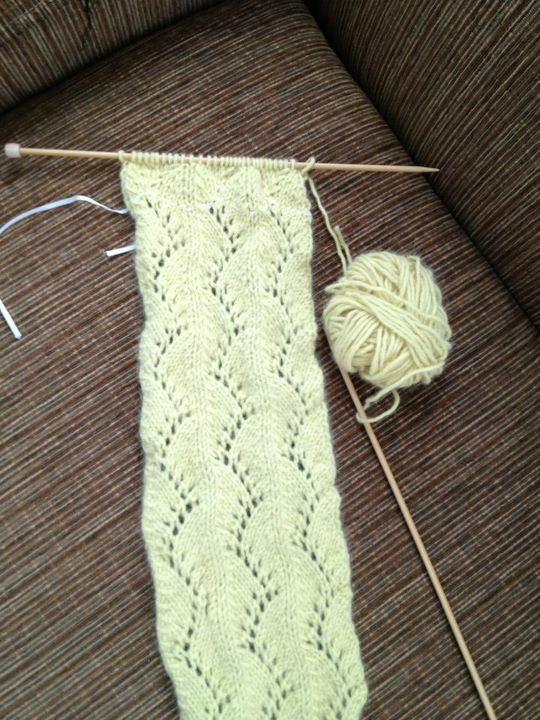 I was on the very last skein of the not so good to knit with yellow yarn. Truthfully that too was a great motivator. Within 20 minutes I had completed the scarf. Then I began to criticize myself for being so ridiculious for NOT finishing it up consdiering how very little needed to be done.